WAHIT offers small businesses the most effective way to access, manage and pay for comprehensive employee benefits. Our model is flexible and customizable. 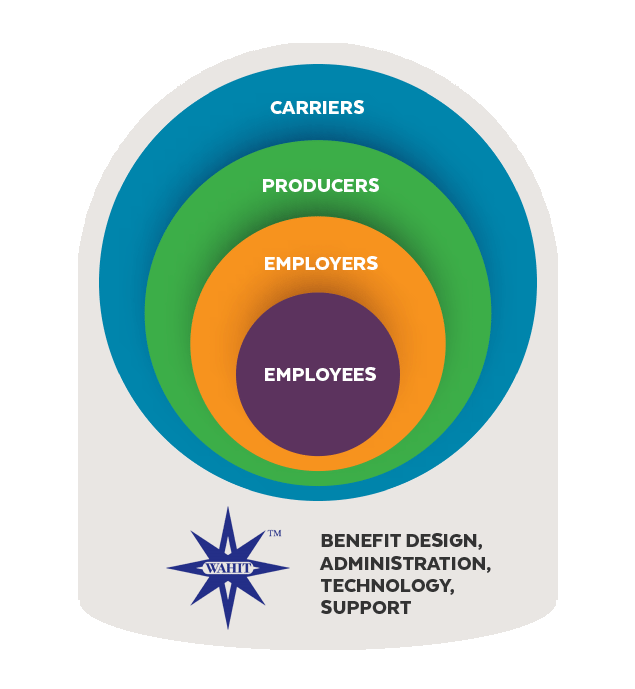 We offer small- to mid-sized businesses attractive benefit packages that combine excellent medical plans from reputable carriers with the other insurance products they want and need to attract and retain quality employees. Premera Blue Cross Medical plans are offered to employers with 2-50 employees. We are a phone call away — whether you are an employer, employee, broker or carrier. Technology is great, but we know it’s not always a substitute for a conversation with a real person. Our stable, mature and secure online benefits management platform offers full-service data integration with carriers including data exchange connections, and management of complex financial transactions. It supports online enrollment and employee communications as well as consolidated billing. We provide expert guidance on security, compliance and regulatory issues to busy HR managers on an ongoing basis, and provide producers with actionable data analysis and reporting to reveal trends and provide insights on purchasing decisions and marketing.